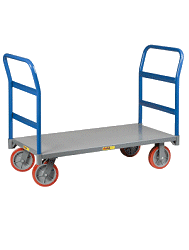 Pallet Jack is designed for Wet or Corrosive Environments. Galvanized Steel Pallet Truck is perfect for use in laboratories, clean rooms, and other wet, corrosive applications. Comfortable corrosion resistant galvanized handle has 3-function hand control (raise, neutral, lower) for smooth control. 27"W x 48"L with 6-1/4"W tapered forks. 7" nylon steer wheels and 3" nylon load wheels. 1 Year Limited Warranty.